It’s Friday and you may still be looking for something to do this SKH Weekend. If you’re still trying to make plans we’ve got some ideas for you that are fun for you and the whole family. From carnival rides and cultural events at downtown Portland’s Cinco de Mayo fest to the big street party at the Filmed by Bike film kick-off, we’ve got you covered. 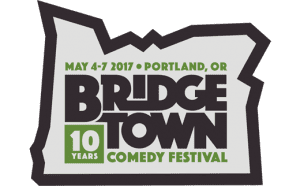 The tenth annual Bridgetown Comedy Festival returns to this week and weekend featuring over 100 of the top comedians in the business, with over 50 of those making their Bridgetown debut. Make sure to check out big stars such as Janeane Garofalo, Eugene Mirman and Ian Karmel. Enjoy live entertainment, authentic food, carnival rides, an artisan village, and family fun at Cinco de Mayo Fiesta at Tom McCall Waterfront Park.This week and weekend the Portland Guadalajara Sister City Association (PGSCA) presents the 33rd annual Cinco de Mayo Fiesta, the largest multicultural festival in the state of Oregon. Held at Tom McCall Waterfront Park the fest features live entertainment including Mariachi Ciudad de Guadalajara, direct from the city of Guadalajara and Oregon’s very own Ballet Folklórico Mexico en La Piel as well as authentic food, carnival rides, an artisan village, and family fun. Filmed by Bike started in 2003 as a small fundraiser but has grown into one of the biggest and best bike events in the country. At the fest see short films about bicycling at Filmed by Bike at the Hollywood Theatre, which on opening night has both films and a free street party. Feel like a kid again at The Great Inflatable Race, which includes at least eight blow-up obstacles you must get over, under, around, or through at Portland International Raceway. You and your friends will feel like kids again as you jump, dive and bounce on our custom-designed inflatables. 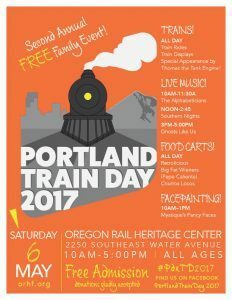 Portland Train Day includes games, live music, a free museum visit, steam trains on display, train rides, and food carts at Oregon Rail Heritage Center. Free.